Bonjour mes amis! 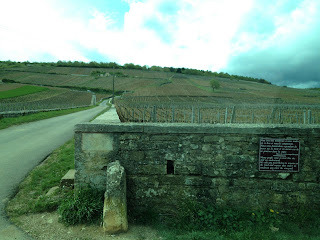 Picking up from where we left off on Tuesday, let's get through the rest of the delicious local food I had in Beaune, as well as a fabulous wine tour around the Côte d'Or where some of the most expensive wine-producing grapes are grown. One of our favorite meals of the trip was had at Le Bistro de L'Hôtel, a restaurant attached to L’Hôtel de Beaune in the center of the village. The service was warm, friendly and attentive. Even the kitchen staff were waving hello to us while we were sitting at our table! 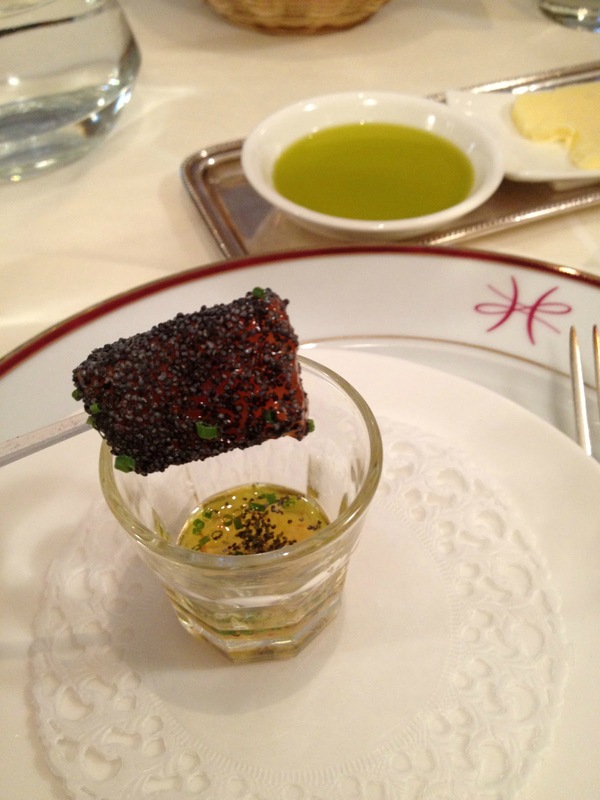 The quality of the food was evident, and flavors were not too heavy or overdone. We started off with an amuse-bouche of tuna rolled in poppy seeds with citrus juice, followed by appetizers: seared tuna with poppy and chives, and a fresh tomato salad. They were all light yet balanced in flavors. The tomatoes were surprisingly delicious - they were cooked and served chilled. Sprinkled with basil and crisps, and with a light coating of olive oil, it was like eating bursts of very fresh tomato sauce. Appetizer: Tomato salad, so fresh! Progressing onto our entree, we ordered the veal for two, which was carved table-side and came with some sides of vegetables. It was brought out on a sizzling hot pan and was still crackling up a storm when it reached our table. It looked soooo good, and it tasted even better! Cooked perfectly medium, it was juicy, tender, and had a wonderful char on the outside. Veal for two, served with mashed potatoes, fries, steamed vegetables and sauce on the side. The veal was so filling, I had no room for dessert. 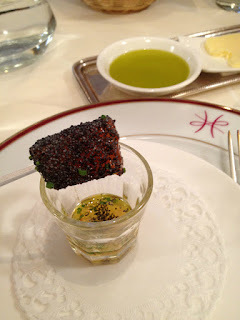 I loved our meal at Le Bistro de L’Hôtel - highly recommended, and be sure to make reservations! It's a slightly fancier setting in Beaune compared to the usual casual spots around town. Let's not forget why we came to Beaune - for the wine! Jack at Trufflepig, planning extraordinaire, arranged a tour with Brendan Moore of Wine Liaisons, who packed our day full of tastings with local winemakers, a lunch at a local spot frequented by the field workers, and a tour through various fields of grapes - all the while pointing out which ones were Grand Crus, Premier Crus, and so on. He even took us by some of the most expensive wine-producing grapes, talk about going to the source of it all! We visited two wine producing families. The first was Gilles Bouton & Fils. We had our first tasting of the day here, and walked away with une bouteille (1 bottle) of the 2010 "La Garenne" from the Puligny-Montrachet appellation, Premier Cru. It seems you must enter every cellar through tiny doors meant for people under 3' tall. Duck your head! 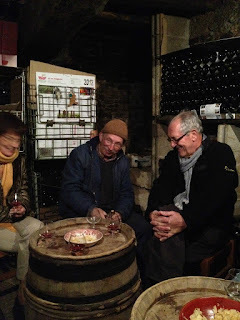 Our second tasting, we visited the cellar of the Battault family. It was so amusing, mainly because of the wine maker himself who is such an entertaining and charming fellow. That's him in the picture below, center with the brown hat. We were tasting with some other patrons (French-speaking), and they were embroiled in energetic discussions about the French election. As if that wasn't entertaining enough, he gave us potato chips to help cleanse our palates. Forget the crackers, I think my new favorite combination is wine with chips! 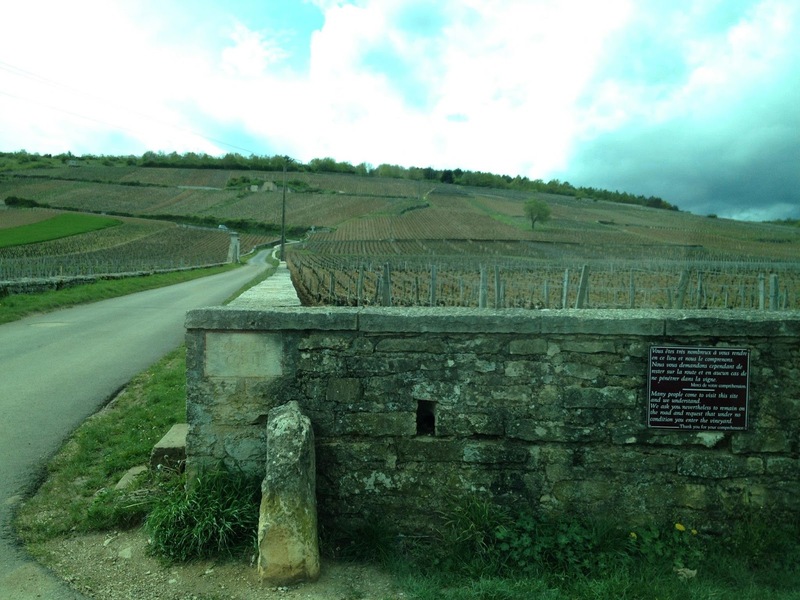 We walked away with a bottle of the 2010 Meursault from Auxey-Durresses. By now we were good and hungry, so Brendan took us to a local casual restaurant in Puligny-Montrachet, L'Estaminet des Meix, which is popular among the people working in the nearby vineyards all day. They must know their food, so we were excited to try it! I ordered chicken with mushrooms and cream sauce, delish! Following lunch, Brendan drove us around to tour some historic sites around the Côte d'Or and of course, the plots where some of the most expensive wine-producing grapes are grown. There is even a sign that thanks you for your interest, but to kindly ask you to refrain from trespassing. It was a fun day touring the beauty of the Côte d'Or. Brendan was fantastic - personable and very knowledgeable about the wine region. Up next on our trip was the Beaujolais region which is so special in its own right. It's a region often overlooked, but has so much history and such friendly people. Check back next week! Until then... À tout à l'heure!